The fresh, sweet-tart flavor make these Lemon Snowball Cookies are a change of pace Christmas Cookie. Easy to make, they are a welcome addition to your holiday cookie plate! • Sift together flour, baking soda and cream of tartar. Set aside. • Using a mixer, cream together Crisco and sugar until light and fluffy. • Add lemon rind and egg, beat well. • Stir in water and lemon juice. • Add sifted flour mixture, blend well. • Stir in nuts by hand. • Refrigerate dough 1-2 hours. • Place 1 inch apart on an ungreased cookie sheet. • Bake at 350° for 10-12 minutes until bottoms are slightly brown. • Immediately remove cookies from the cookie sheet, and roll them in confectionery sugar. • To print the Lemon Snowball Cookie Recipe, click here. 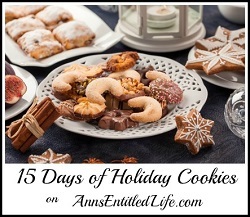 Day 7 of 15 Days of Holiday Cookies on Ann’s Entitled Life the brings us this fresh and delicious Lemon Snowball Cookie Recipe! I hope you all like them, Stephanie! Hostess-ing a Christmas hoo-ha Sunday evening, and I still need to decide on sweets for the evening. Any experience freezing these? (As I have tons to do between now and Sunday eve 😉 . ) Anything make ahead at this point would be amaaaaaazing. Oh Donna, the best freezing cookies recipe I am posting isn’t until next week. As far as these go … I have never frozen them, so I don’t know. I am sorry. What do you mean the ‘best freezing’ cookies are next week? Haha…just joking. I guess we didn’t communicate on my social obligations, huh? No big deal… I’m working on the main courses. Fortunately, the hubby likes to bake, so he’s kind of got that going (I think). I did make some fudge today – I know it will freeze. I was curious also because I myself LOVE lemon and have all these fresh lemons ready to fall off the tree – must use them!!! It was stupid on my part, Donna – they should have been scheduled first so they could have been ummm, frozen, and the delicate, last minute cookies scheduled last. If you do freeze them, please let me know how they turned out after thawed! It does make sense, Donna. Unlike many cookies of this type (Mexican wedding cakes for instance), you take them off the cookie sheet hot and roll immediately. I wonder if you will have to warm them a minute when thawed, or if the confectionery sugar will stick immediately when thawed? Yummm, these look like they will look…and taste… just great on my Christmas cookie list! Tks for posting.